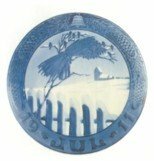 From an old book of a hundred years ago comes this commentary: "One of the prettiest of Christmas customs is the Norwegian practice of giving, on Christmas Day, a dinner to the birds. 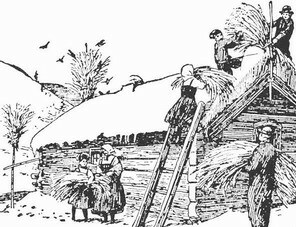 On Christmas morning every gable, gateway, or barn-door, is decorated with a sheaf of grain fixed on the top of a tall pole, wherefrom it is intended that the birds should make their Christmas dinner. 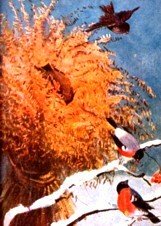 Even the peasants contrive to have a handful set by for this purpose, and what the birds do not eat on Christmas Day, remains for them to finish at their leisure during the winter." And the peasant had but three. 'For the Christ-child's sake,' he said." To sing our evening hymn." The birds as well as men." With a sorrowful, downcast face. "Homeless and friendless, alas! am I,"
"Will come on New Year's day." The birdlings listened with mute surprise. When he had but three for bread. This good man in distress;"
"Is a shining coin of gold." In the radiant light of the sun." And a miracle wrought," he said. For the blessed Christ-child's sake." "The fields of kindness bear golden grain,"